Location: Corfu Greece.The Ikos Dassia is approximately 20 minutes from Corfu Airport. Description: These spacious and elegantly designed suites are equipped with private gardens where guests can peacefully relax and enjoy soaking up the sun. These rooms cover space of 40 m2 and are ideal for accommodating two adults and one child or three adults. What makes these rooms Deluxe is the combination of living room and bedroom into one open plan area. The guests also have a quick access to the beach and the swimming pool, so Deluxe Junior Suites are perfect for spending top holiday with your family. Surrounded by tall fragrant trees, Ikos Dassia resort offers fantastic views over the Ionian Sea. When it comes to dining, at the Ikos Dassia, Michelin-star chefs will be there to provide all kinds of dishes, including Greek, Italian, French, Buffet and even Asian. A-la-carte dinning, sophisticated restaurants and vibrant bars are all there for guests to enjoy. Clients of the Dassia are able to hire a Mini Cooper for the day plus use a dine out option that includes a boat ride. Both options must be pre-booked on resort. Occupancy: The price shown here is based on 2 Adults sharing a DELUXE Junior Suite Garden View on an All Inclusive basis. This room may accommodate a maximum of 3. 3 Adults or 2 Adults 1 Child. Extra beds are a sofa bed and a camp beds. Description: Deluxe One Bedroom Bungalow Suites are equipped with luxurious amenities and offer a great living space for maximum comfort. Spacious, bright, and elegant suites come with a spacious lounge area and a separate bedroom. 50 m2, these bungalow suites can comfortably accommodate up to five people.? Clients of the Dassia are able to hire a Mini Cooper for the day plus use a dine out option that includes a boat ride. Both options must be pre-booked on resort. Occupancy: The price shown here is based on 2 Adults plus 2 Children 12yrs and under sharing a DELUXE One Bed Bungalow Suite Pool View on an All Inclusive basis. This room may accommodate a maximum of 5. 3 Adults 2 Children or 2 Adults 3 Children. Extra beds are a sofa bed and a camp beds. Description: . Deluxe One Bedroom Bungalow Suites are equipped with luxurious amenities and offer great living space for maximum comfort. Spacious, bright, and elegant suites come with a spacious lounge area and a separate bedroom . 50m2, these bungalow suites can comfortably accommodate up to five people. Clients of the Dassia are able to hire a Mini Cooper for the day plus use a dine out option that includes a boat ride. Both options must be pre-booked on resort. Description: Deluxe One Bedroom Bungalow Suites are equipped with luxurious amenities and offer a great living space for maximum comfort. Spacious, bright, and elegant suites come with a spacious lounge area and a separate bedroom. 50 m2, these bungalow suites can comfortably accommodate up to five people. Clients of the Dassia are able to hire a Mini Cooper for the day plus use a dine out option that includes a boat ride. Both options must be pre-booked on resort. Description: Deluxe One Bedroom Bungalow Suites are equipped with luxurious amenities and offer a great living space for maximum comfort. Spacious, bright, and elegant suites come with a spacious lounge area and a separate bedroom. 50 m2, these bungalow suites can comfortably accommodate up to five people. Air-conditioning and heating, Flat Screen TV with satellite channels, Mini Bar, Coffee & Tea making facilities, Safety Box, Wi-Fi, Hairdryer, Bathrobes, and Slippers, are standard amenities in these beautiful suites. Clients of the Dassia are able to hire a Mini Cooper for the day plus use a dine out option that includes a boat ride. Both options must be pre-booked on resort. Description: Situated on Corfu's Ioanian Coast, nestled in the midst of spectacular scenery, Ikos Dassia will provide you an unforgettable holiday experience. Surrounded by tall fragrant trees, Ikos Dassia resort offers fantastic views over the Ionian Sea. Perfectly designed rooms and spacious suites will all offer private balconies, pools, and gardens. Each and every room will provide you with a luxurious and relaxing holiday experience that you will enjoy. When it comes to dining, at the Ikos Dassia, Michelin-star chefs will be there to provide all kinds of dishes, including Greek, Italian, French, Buffet and even Asian. A-la-carte dinning, sophisticated restaurants and vibrant bars are all there for guests to enjoy. Deluxe One Bedroom Bungalow Suites are equipped with luxurious amenities and offer great living space for maximum comfort. Spacious, bright, and elegant suites come with a nice lounge area and a separate bedroom for bigger privacy. Covering large space of 50 m2, these bungalow suites can comfortably accommodate up to five people. Deluxe One Bedroom Bungalow Suite also offers quick access to the swimming pool and the Deluxe Collection beach. Clients of the Dassia are able to hire a Mini Cooper for the day plus use a dine out option that includes a boat ride. Both options must be pre-booked on resort. Occupancy: The price shown here is based on 2 Adults sharing a DELUXE One Bed Bungalow Suite Pool View on an All Inclusive basis. This room may accommodate a maximum of 5. 3 Adults 2 Children or 2 Adults 3 Children. Extra beds are a sofa bed and a camp beds. Description: Deluxe One Bed Bungalow Suites with Private Pool, Beach Front as the name suggests, have a fantastic beach front location from where you can enjoy spectacular sea views. Occupying a large space of 50 m2, these bungalow suites are ideal for accommodating two adults and three children. Bungalow suites are all equipped with luxurious amenities, private pool, wide lounge area and a separate bedroom. These bungalows are top choice if you want to enjoy great sea views, fully relax, and if you value comfort, privacy and luxury. Clients of the Dassia are able to hire a Mini Cooper for the day plus use a dine out option that includes a boat ride. Both options must be pre-booked on resort. Occupancy: The price shown here is based on 2 Adults plus 2 Children 11yrs and under sharing a DELUXE One Bed Bungalow Suite Private Pool Beach Front on an All Inclusive basis. This room may accommodate a maximum of 5. 3 Adults 2 Children or 2 Adults 3 Children. Extra beds are a sofa bed and a camp beds. Description: Deluxe One Bed Bungalow Suites with Private Pool Beach Front as the name suggests, have a fantastic beach front location from where you can enjoy spectacular sea views. Occupying a large space of 50 m2, these bungalow suites are ideal for accommodating two adults and three children. Bungalow suites are all equipped with luxurious amenities, private pool, wide lounge area and a separate bedroom. Clients of the Dassia are able to hire a Mini Cooper for the day plus use a dine out option that includes a boat ride. Both options must be pre-booked on resort. Description: Situated on Corfu's Ioanian Coast, nestled in the midst of spectacular scenery, Ikos Dassia will provide you an unforgettable holiday experience. Surrounded by tall fragrant trees, Ikos Dassia resort offers fantastic views over the Ionian Sea. All hotel services and features are taken to another level, matching the unique Infinite Lifestyle holiday concept. 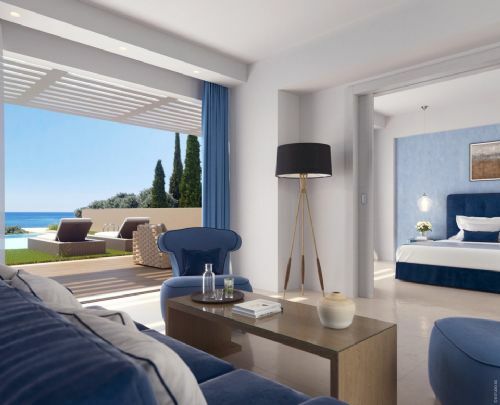 Perfectly designed rooms and spacious suites will all offer private balconies, pools, and gardens.When it comes to dining, at the Ikos Dassia, Michelin-star chefs will be there to provide all kinds of dishes, including Greek, Italian, French, Buffet and even Asian. A-la-carte dinning, sophisticated restaurants and vibrant bars are all there for guests to enjoy. One Bed Bungalow Suites with Private Pool Beach Front as the name suggests, have a fantastic beachfront location from where you can enjoy spectacular sea views. Occupying a large space of 50 m2, these bungalow suites are ideal for accommodating two adults and three children. Bungalow suites are all equipped with luxurious amenities, private pool, wide lounge area and a separate bedroom. These bungalows are top choice if you want to enjoy great sea views, fully relax, and if you value comfort, privacy and luxury. Clients of the Dassia are able to hire a Mini Cooper for the day plus use a dine out option that includes a boat ride. Both options must be pre-booked on resort. Description: Situated on Corfu's Ioanian Coast, nestled in the midst of spectacular scenery, Ikos Dassia will provide you an unforgettable holiday experience. Surrounded by tall fragrant trees, Ikos Dassia resort offers fantastic views over the Ionian Sea. All hotel services and features are taken to another level, matching the unique Infinite Lifestyle holiday concept. Perfectly designed rooms and spacious suites will all offer private balconies, pools, and gardens. When it comes to dining, at the Ikos Dassia, Michelin-star chefs will be there to provide all kinds of dishes, including Greek, Italian, French, Buffet and even Asian. A-la-carte dinning, sophisticated restaurants and vibrant bars are all there for guests to enjoy. Deluxe two bedroom bungalow suites cover a large space of 85 m2 and are ideal for accommodating up to six people. Designed in contemporary style, these luxurious suites come with large lounge and two separate bedrooms for bigger privacy and comfort. 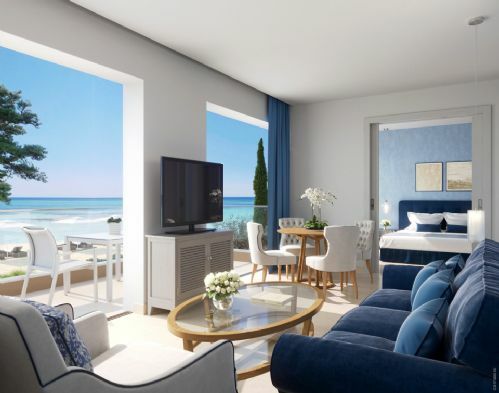 Equipped with luxurious amenities and top quality furniture and fabrics, these suites also offer access to the pool and the Deluxe Collection beach. Clients of the Dassia are able to hire a Mini Cooper for the day plus use a dine out option that includes a boat ride. Both options must be pre-booked on resort. Occupancy: The price shown here is based on 4 Adults and 2 Children 11yrs and under sharing a DELUXE Two Bed Bungalow Suite with Pool View on an All Inclusive basis. This villa may accommodate a maximum of 6. 4 Adults 2 Children or 3 Adults 3 Children. Extra beds are a sofa bed and a camp beds. Description: Situated on Corfu's Ioanian Coast, nestled in the midst of spectacular scenery, Ikos Dassia will provide you an unforgettable holiday experience. Surrounded by tall fragrant trees, Ikos Dassia resort offers fantastic views over the Ionian Sea. All hotel services and features are taken to another level, matching the unique Infinite Lifestyle holiday concept. Perfectly designed rooms and spacious suites will all offer private balconies, pools, and gardens. When it comes to dining, at the Ikos Dassia, Michelin-star chefs will be there to provide all kinds of dishes, including Greek, Italian, French, Buffet and even Asian. A-la-carte dinning, sophisticated restaurants and vibrant bars are all there for guests to enjoy. These ultra-luxurious and very spacious bungalow suites offer splendid views on the Ionian Sea. Covering an area of 90 m2 and featuring private pools, these suites are ideal for comfortable accommodation of six guests. Suites come with separate lounge area and two bedrooms, and the interior design reflects contemporary style with elegant local touches. This is ideal suite for larger families and group of friends vacationing together. Clients of the Dassia are able to hire a Mini Cooper for the day plus use a dine out option that includes a boat ride. Both options must be pre-booked on resort. Occupancy: The price shown here is based on 2 Adults plus 2 Children 11yrs and under sharing a DELUXE Two Bed Bungalow Suite with Private Pool Beach Sea View on an All Inclusive basis. This villa may accommodate a maximum of 6. 4 Adults 2 Children or 3 Adults 3 Children. Extra beds are a sofa bed and a camp beds. Description: Situated on Corfu's Ioanian Coast, nestled in the midst of spectacular scenery, Ikos Dassia will provide you an unforgettable holiday experience. Surrounded by tall fragrant trees, Ikos Dassia resort offers fantastic views over the Ionian Sea. All hotel services and features are taken to another level, matching the unique Infinite Lifestyle holiday concept. Perfectly designed rooms and spacious suites will all offer private balconies, pools, and gardens. When it comes to dining, at the Ikos Dassia, Michelin-star chefs will be there to provide all kinds of dishes, including Greek, Italian, French, Buffet and even Asian. A-la-carte dinning, sophisticated restaurants and vibrant bars are all there for guests to enjoy. These ultra-luxurious and very spacious bungalow suites offer splendid views on the Ionian Sea. Covering an area of 90 m2 and featuring private pools, these suites are ideal for comfortable accommodation of six guests. Suites come with separate lounge area and two bedrooms, and the interior design reflects contemporary style with elegant local touches. This is ideal suite for larger families and group of friends vacationing together. Clients of the Dassia are able to hire a Mini Cooper for the day plus use a dine out option that includes a boat ride. Both options must be pre-booked on resort.Clients of the Dassia are able to hire a Mini Cooper for the day plus use a dine out option that includes a boat ride. Both options must be pre-booked on resort. Clients of the Dassia are able to hire a Mini Cooper for the day plus use a dine out option that includes a boat ride. Both options must be pre-booked on resort. Occupancy: The price shown here is based on 3 Adults sharing a DELUXE Two Bed Bungalow Suite with Private Pool Beach Sea View on an All Inclusive basis. This villa may accommodate a maximum of 6. 4 Adults 2 Children or 3 Adults 3 Children. Extra beds are a sofa bed and a camp beds. Description: Situated on Corfu's Ioanian Coast, nestled in the midst of spectacular scenery, Ikos Dassia will provide you an unforgettable holiday experience. Surrounded by tall fragrant trees, Ikos Dassia resort offers fantastic views over the Ionian Sea. All hotel services and features are taken to another level, matching the unique Infinite Lifestyle holiday concept. Perfectly designed rooms and spacious suites will all offer private balconies, pools, and gardens. When it comes to dining, at the Ikos Dassia, Michelin-star chefs will be there to provide all kinds of dishes, including Greek, Italian, French, Buffet and even Asian. A-la-carte dinning, sophisticated restaurants and vibrant bars are all there for guests to enjoy. Deluxe two bedroom villas have an exclusive location and offer the highest level of privacy. These ultra-large and ultra-luxurious family villas are unbeatable when it comes to privacy and comfort. These villas cover a stunningly large space of 120 m2, which makes them ideal for accommodating up to seven people. There are two separate bedrooms for added privacy, while the luxurious lounge area is very nice place for relaxing with your family and friends. Villas come with private pools and gardens where you can chill out, sip cocktails, and admire the spectacular views over the Ionian Sea. Clients of the Dassia are able to hire a Mini Cooper for the day plus use a dine out option that includes a boat ride. Both options must be pre-booked on resort. Clients of the Dassia are able to hire a Mini Cooper for the day plus use a dine out option that includes a boat ride. Both options must be pre-booked on resort. Occupancy: The price shown here is based on 2 Adults plus 2 Children 11yrs and under sharing a DELUXE Two Bed Villa with Private Pool Beach Front on an All Inclusive basis. This villa may accommodate a maximum of 7. 4 Adults 3 Children or 3 Adults 4 Children. Extra beds are a sofa bed and a camp beds. Description: Situated on Corfu's Ioanian Coast, nestled in the midst of spectacular scenery, Ikos Dassia will provide you an unforgettable holiday experience. Surrounded by tall fragrant trees, Ikos Dassia resort offers fantastic views over the Ionian Sea. All hotel services and features are taken to another level, matching the unique Infinite Lifestyle holiday concept. Perfectly designed rooms and spacious suites will all offer private balconies, pools, and gardens. When it comes to dining, at the Ikos Dassia, Michelin-star chefs will be there to provide all kinds of dishes, including Greek, Italian, French, Buffet and even Asian. A-la-carte dinning, sophisticated restaurants and vibrant bars are all there for guests to enjoy. Deluxe two bedroom villas have an exclusive location and offer the highest level of privacy. These ultra-large and ultra-luxurious family villas are unbeatable when it comes to privacy and comfort. These villas cover a stunningly large space of 120 m2, which makes them ideal for accommodating up to seven people. There are two separate bedrooms for added privacy, while the luxurious lounge area is very nice place for relaxing with your family and friends. Villas come with private pools and gardens where you can chill out, sip cocktails, and admire the spectacular views over the Ionian Sea. Clients of the Dassia are able to hire a Mini Cooper for the day plus use a dine out option that includes a boat ride. Both options must be pre-booked on resort. Occupancy: The price shown here is based on 3 Adults plus 2 Children 11yrs and under sharing a DELUXE Two Bed Villa with Private Pool Beach Front on an All Inclusive basis. This villa may accommodate a maximum of 7. 4 Adults 3 Children or 3 Adults 4 Children. Extra beds are a sofa bed and a camp beds. Description: Situated on Corfu's Ioanian Coast, nestled in the midst of spectacular scenery, Ikos Dassia will provide you an unforgettable holiday experience. Surrounded by tall fragrant trees, Ikos Dassia resort offers fantastic views over the Ionian Sea. All hotel services and features are taken to another level, matching the unique Infinite Lifestyle holiday concept. Perfectly designed rooms and spacious suites will all offer private balconies, pools, and gardens. When it comes to dining, at the Ikos Dassia, Michelin-star chefs will be there to provide all kinds of dishes, including Greek, Italian, French, Buffet and even Asian. A-la-carte dinning, sophisticated restaurants and vibrant bars are all there for guests to enjoy. Being a family-friendly resort means that children of all ages are properly taken care of at Ikos Dassia resort. Deluxe two bedroom villas have an exclusive location and offer the highest level of privacy. These ultra-large and ultra-luxurious family villas are unbeatable when it comes to privacy and comfort. These villas cover a stunningly large space of 120 m2, which makes them ideal for accommodating up to seven people. There are two separate bedrooms for added privacy, while the luxurious lounge area is very nice place for relaxing with your family and friends. Villas come with private pools and gardens where you can chill out, sip cocktails, and admire the spectacular views over the Ionian Sea. Clients of the Dassia are able to hire a Mini Cooper for the day plus use a dine out option that includes a boat ride. Both options must be pre-booked on resort. Occupancy: The price shown here is based on 4 Adults plus 3 Children 11yrs and under sharing a DELUXE Two Bed Villa with Private Pool Beach Front on an All Inclusive basis. This villa may accommodate a maximum of 7. 4 Adults 3 Children or 3 Adults 4 Children. Extra beds are a sofa bed and a camp beds. Occupancy: The price shown here is based on 2 Adults plus 2 Children 11yrs and under sharing a DELUXE Two Bed Bungalow Suite with Pool View on an All Inclusive basis. This villa may accommodate a maximum of 6. 4 Adults 2 Children or 3 Adults 3 Children. Extra beds are a sofa bed and a camp beds. Occupancy: The price shown here is based on 2 Adults plus 4 Children 11yrs and under sharing a DELUXE Two Bed Bungalow Suite with Pool View on an All Inclusive basis. This villa may accommodate a maximum of 6. 4 Adults 2 Children or 3 Adults 3 Children. Extra beds are a sofa bed and a camp beds. Occupancy: The price shown here is based on 4 Adults sharing a DELUXE Two Bed Bungalow Suite with Pool View on an All Inclusive basis. This villa may accommodate a maximum of 6. 4 Adults 2 Children or 3 Adults 3 Children. Extra beds are a sofa bed and a camp beds. Occupancy: The price shown here is based on 2 Adults plus 2 Children 11yrs and under sharing a DELUXE Two Bed Suite with Private Pool Beach Front on an All Inclusive basis. This villa may accommodate a maximum of 6. 6 Adults or 3 Adults 3 Children. Extra beds are a sofa bed and a camp beds. Occupancy: The price shown here is based on 2 Adults plus 2 Children 11yrs and under sharing a DELUXE Two Bed Bungalow Suite with Sea View on an All Inclusive basis. This villa may accommodate a maximum of 6. 4 Adults 2 Children or 3 Adults 3 Children. Extra beds are a sofa bed and a camp beds. Occupancy: The price shown here is based on 3 Adults plus 2 Children 11yrs and under sharing a DELUXE Two Bed Bungalow Suite with Sea View on an All Inclusive basis. This villa may accommodate a maximum of 6. 4 Adults 2 Children or 3 Adults 3 Children. Extra beds are a sofa bed and a camp beds. Description: Family rooms are located in the main building of Ikos Dassia Resort. These family rooms cover space of 50 m2, ideal for up to four people. They are modern style, with furnished private balconies, quality equipped bathrooms, in-room safe, fully stocked mini-bar, coffee & tea making facilities. Family rooms comprise of two spacious double rooms interconnecting - each with it's own shower-room. Clients of the Dassia are able to hire a Mini Cooper for the day plus use a dine out option that includes a boat ride. Both options must be pre-booked on resort and are included in the price. Occupancy: The price shown here is based on 2 Adults plus 2 Children 11 yrs and under sharing a Family Room Inland View on an All Inclusive basis. This room may accommodate a maximum of 4 people, 4 Adults or 2 Adults 2 Children. Occupancy: The price shown here is based on 2 Adults plus 2 Children 1 1yrs and under sharing a Family Room Inland View on an All Inclusive basis. This room may accommodate a maximum of 4 people, 4 Adults or 2 Adults 2 Children. Description: Family rooms are located in the main building of Ikos Dassia Resort. These family rooms cover space of 50 m2, ideal for up to four people. They are modern style, with furnished private balconies, quality equipped bathrooms, in-room safe, fully stocked mini-bar, coffee & tea making facilities. Family rooms comprise of two spacious double rooms interconnecting - each with it's own shower-room Clients of the Dassia are able to hire a Mini Cooper for the day plus use a dine out option that includes a boat ride. Both options must be pre-booked on resort and are included in the price. Occupancy: The price shown here is based on 4 Adults sharing a Family Room Inland View on an All Inclusive basis. This room may accommodate a maximum of 4 people, 4 Adults or 2 Adults 2 Children. Description: Situated on Corfu's Ioanian Coast, nestled in the midst of spectacular scenery, Ikos Dassia will provide you an unforgettable holiday experience. Surrounded by tall fragrant trees, Ikos Dassia resort offers fantastic views over the Ionian Sea. All hotel services and features are taken to another level, matching the unique Infinite Lifestyle holiday concept. Perfectly designed rooms and spacious suites will all offer private balconies, pools, and gardens. . When it comes to dining, at the Ikos Dassia, Michelin-star chefs will be there to provide all kinds of dishes, including Greek, Italian, French, Buffet and even Asian. A-la-carte dinning, sophisticated restaurants and vibrant bars are all there for guests to enjoy. Family rooms are located in the main building of Ikos Dassia Resort. These family rooms cover space of 50 m2, ideal for up to four people. Family rooms are designed in modern style, and are perfect for families that value comfort and that want to fully relax. Furnished private balconies, large panoramic windows from where you can enjoy fantastic views over the Ionian Sea or the gardens, quality equipped bathrooms, and well designed rooms are some features of these rooms. Clients of the Dassia are able to hire a Mini Cooper for the day plus use a dine out option that includes a boat ride. Both options must be pre-booked on resort. Occupancy: The price shown here is based on 2 Adults plus 2 Children 11yrs and under sharing a Family Room Sea View on an All Inclusive basis. This room may accommodate a maximum of 4 people, 4 Adults or 2 Adults 2 Children. Description: Situated on Corfu's Ioanian Coast, nestled in the midst of spectacular scenery, Ikos Dassia will provide you an unforgettable holiday experience. Surrounded by tall fragrant trees, Ikos Dassia resort offers fantastic views over the Ionian Sea. All hotel services and features are taken to another level, matching the unique Infinite Lifestyle holiday concept. Perfectly designed rooms and spacious suites will all offer private balconies, pools, and gardens. When it comes to dining, at the Ikos Dassia, Michelin-star chefs will be there to provide all kinds of dishes, including Greek, Italian, French, Buffet and even Asian. A-la-carte dinning, sophisticated restaurants and vibrant bars are all there for guests to enjoy. Family rooms are located in the main building of Ikos Dassia Resort. These family rooms cover space of 50 m2, ideal for up to four people. Family rooms are designed in modern style, and are perfect for families that value comfort and that want to fully relax. Furnished private balconies, large panoramic windows from where you can enjoy fantastic views over the Ionian Sea or the gardens, quality equipped bathrooms, and well designed rooms are some features of these rooms. Clients of the Dassia are able to hire a Mini Cooper for the day plus use a dine out option that includes a boat ride. Both options must be pre-booked on resort. Occupancy: The price shown here is based on 4 Adults sharing a Family Room Sea View on an All Inclusive basis. This room may accommodate a maximum of 4 people, 4 Adults or 2 Adults 2 Children. Description:. Junior Suites are large family suites, with extra space for a third person. Occupying 35 m2, these rooms have furnished private balconies, quality equipped bathrooms, in-room safe, fully stocked mini-bar, coffee & tea making facilities. The interior is designed in contemporary style and all rooms are very comfortable and bright. Junior Suites are fully equipped with top quality amenities, so you will always feel comfortable and welcome. Clients of the Dassia are able to hire a Mini Cooper for the day plus use a dine out option that includes a boat ride. Both options must be pre-booked on resort and are included in the price. Occupancy: The price shown here is based on 2 Adults plus 1 Child 11 yrs and under sharing a Junior Suite Inland View on an All Inclusive basis. This room may accommodate a maximum of 3. (3 Adults or 2 Adults 1 Child) The extra bed is a sofa bed. Description: Junior Suites are large family suites, with extra space for a third person. Occupying 35 m2, these rooms have furnished private balconies, quality equipped bathrooms, in-room safe, fully stocked mini-bar, coffee & tea making facilities The interior is designed in contemporary style and all rooms are very comfortable and bright. Junior Suites are fully equipped with top quality amenities, so you will always feel comfortable and welcome. Clients of the Dassia are able to hire a Mini Cooper for the day plus use a dine out option that includes a boat ride. Both options must be pre-booked on resort and are included in the price. Occupancy: The price shown here is based on 3 Adults sharing a Junior Suite Inland View on an All Inclusive basis. The extra bed is a sofa bed. Occupancy: The price shown here is based on 3 Adults sharing a Junior Suite Sea View on an All Inclusive basis. The extra bed is a sofa bed. Description: Situated on Corfu's Ioanian Coast, nestled in the midst of spectacular scenery, Ikos Dassia will provide you an unforgettable holiday experience. Surrounded by tall fragrant trees, Ikos Dassia resort offers fantastic views over the Ionian Sea. All hotel services and features are taken to another level, matching the unique Infinite Lifestyle holiday concept. Perfectly designed rooms and spacious suites will all offer private balconies, pools, and gardens. When it comes to dining, at the Ikos Dassia, Michelin-star chefs will be there to provide all kinds of dishes, including Greek, Italian, French, Buffet and even Asian. A-la-carte dinning, sophisticated restaurants and vibrant bars are all there for guests to enjoy. These Bungalow Suites are elegant, stylish and ultra-spacious, offering maximum comfort for the guests. The relaxing lounge area allows extra privacy, while the separate bedroom is a great feature. The extra large private balcony is ideal for relaxation and enjoying splendid sunsets, while from the garden you can enjoy magnificent views over the Ionian Sea. One Bedroom Bungalow Suites cover space of 50 m2 and can accommodate up to five people. Clients of the Dassia are able to hire a Mini Cooper for the day plus use a dine out option that includes a boat ride. Both options must be pre-booked on resort. Occupancy: The price shown here is based on 2 Adults plus 1 Child 11yrs and under sharing a One Bed Suite Balcony/Private Garden Sea View on an All Inclusive basis. This room may accommodate a maximum of 5. 3 Adults 2 Children or 2 Adults 3 Children. Extra beds are a sofa bed and a camp beds. Occupancy: The price shown here is based on 2 Adults plus 2 Children 11yrs and under sharing a One Bed Suite Balcony/Private Garden Sea View on an All Inclusive basis. This room may accommodate a maximum of 5. 3 Adults 2 Children or 2 Adults 3 Children. Extra beds are a sofa bed and a camp beds. Occupancy: The price shown here is based on 2 Adults plus 3 Children 11yrs and under sharing a One Bed Suite Balcony/Private Garden Sea View on an All Inclusive basis. This room may accommodate a maximum of 5. 3 Adults 2 Children or 2 Adults 3 Children. Extra beds are a sofa bed and a camp beds. Occupancy: The price shown here is based on 3 Adults plus 2 Children 11yrs and under sharing a One Bed Suite Balcony/Private Garden Sea View on an All Inclusive basis. This room may accommodate a maximum of 5. 3 Adults 2 Children or 2 Adults 3 Children. Extra beds are a sofa bed and a camp beds. Description: Situated on Corfu's Ioanian Coast, nestled in the midst of spectacular scenery, Ikos Dassia will provide you an unforgettable holiday experience. Surrounded by tall fragrant trees, Ikos Dassia resort offers fantastic views over the Ionian Sea. All hotel services and features are taken to another level, matching the unique Infinite Lifestyle holiday concept. Perfectly designed rooms and spacious suites will all offer private balconies, pools, and gardens. When it comes to dining, at the Ikos Dassia, Michelin-star chefs will be there to provide all kinds of dishes, including Greek, Italian, French, Buffet and even Asian. A-la-carte dinning, sophisticated restaurants and vibrant bars are all there for guests to enjoy. 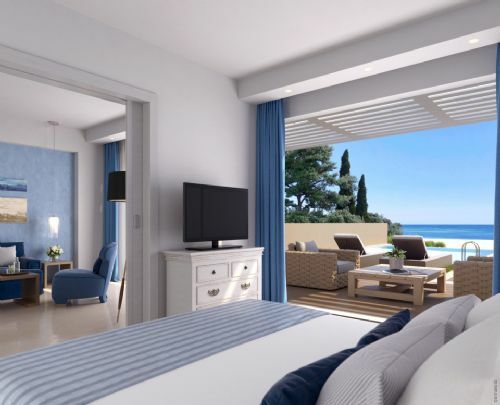 Panorama Junior Suites are facing the Ionian Sea and these suites offer amazing panoramic views. The stylish seating area is an added feature to these family suites, which occupy a large space of 35 m2. Panorama Junior Suites can accommodate up to four people, and are ideal for families of two adults and two children. The balcony is fully furnished and the private garden is another lovely space where you can enjoy while on holiday. Air-conditioning and heating, Flat Screen TV with satellite channels, Mini Bar, Coffee & Tea making facilities, Safety Box, Wi-Fi, Hairdryer, Bathrobes, and Slippers, are standard amenities in these beautiful suites. Clients of the Dassia are able to hire a Mini Cooper for the day plus use a dine out option that includes a boat ride. Both options must be pre-booked on resort. Occupancy: The price shown here is based on 2 Adults plus 2 Children 11yrs and under sharing a Panorama Junior Suite Private Garden Sea View on an All Inclusive basis. This room may accommodate a maximum of 4. 3 Adults or 2 Adults 2 Children or 3 Adults 1 Child. Extra beds are a sofa bed and a camp bed. 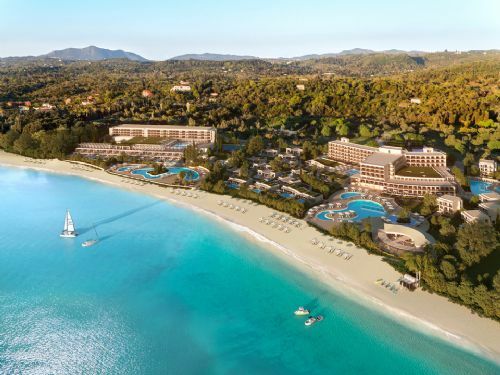 Occupancy: The price shown here is based on 2 Adults plus 2 Children 11yrs and under sharing a Panorama Junior Suite Sea View on an All Inclusive basis. This room may accommodate a maximum of 4. 3 Adults or 2 Adults 2 Children or 3 Adults 1 Child. Extra beds are a sofa bed and a camp bed. Occupancy: The price shown here is based on 3 Adults plus 1 Child 11yrs and under sharing a Panorama Junior Suite Sea View on an All Inclusive basis. This room may accommodate a maximum of 4. 3 Adults or 2 Adults 2 Children or 3 Adults 1 Child. Extra beds are a sofa bed and a camp bed. Description: The Double Rooms are modern in style and located in the main building. Double rooms occupy space of 23 m2 and can accommodate up to two people. Double rooms are equipped with finest amenities such as AC, DVD/CD Player, Flat Screen Satellite TV, Wi-Fi Internet, Safety Box, Mini Bar, Coffee & Tea making facilities, Hairdryer, Bathrobes, Slippers, and all have furnished balconies. Clients of the Dassia are able to hire a Mini Cooper for the day plus use a dine out option that includes a boat ride. Both options must be pre-booked on resort and are included in the price. Occupancy: The price shown here is based on 2 Adults sharing a Promotional Double Room Inland View on an All Inclusive basis. Description: The Double Rooms are modern style and are located in the main building. They occupy space of 23 m2 and can accommodate up to two people. Double rooms are equipped with finest amenities such as AC, DVD/CD Player, Flat Screen Satellite TV, Wi-Fi Internet, Safety Box, Mini Bar, Coffee & Tea making facilities, Hairdryer, Bathrobes, Slippers, and all have furnished balconies. Clients of the Dassia are able to hire a Mini Cooper for the day plus use a dine out option that includes a boat ride. Both options must be pre-booked on resort and are included in the price. Occupancy: The price shown here is based on 2 Adults sharing a Superior Room Inland View on an All Inclusive basis. Description: Situated on Corfu's Ioanian Coast, nestled in the midst of spectacular scenery, Ikos Dassia will provide you an unforgettable holiday experience. Surrounded by tall fragrant trees, Ikos Dassia resort offers fantastic views over the Ionian Sea. All hotel services and features are taken to another level, matching the unique Infinite Lifestyle holiday concept. Perfectly designed rooms and spacious suites will all offer private balconies, pools, and gardens. When it comes to dining, at the Ikos Dassia, Michelin-star chefs will be there to provide all kinds of dishes, including Greek, Italian, French, Buffet and even Asian. A-la-carte dinning, sophisticated restaurants and vibrant bars are all there for guests to enjoy. The Double Rooms are modern style meets traditional architecture in rooms located in the main building. Furnished balconies and panoramic windows offer amazing views over the Ionian Sea or the green gardens. Double rooms occupy space of 23 m2 and can accommodate up to two people. Double rooms are equipped with finest amenities such as AC, DVD/CD Player, Flat Screen Satellite TV, Wi-Fi Internet, Safety Box, Mini Bar, Coffee & Tea making facilities, Hairdryer, Bathrobes, Slippers, and all have furnished balconies. Clients of the Dassia are able to hire a Mini Cooper for the day plus use a dine out option that includes a boat ride. Both options must be pre-booked on resort. Occupancy: The price shown here is based on 2 Adults sharing a Superior Room Sea View on an All Inclusive basis. This room may accommodate a maximum of 2 adults.